Step 1. The wastewater for the City of Niagara Falls enters the plant in a large wet well from which four large pumps lift the water up and through screens that remove large solids. These solids go to a dumpster for disposal. Step 2. The water then goes through a process in which all the grit is removed. Grit is comprised of solids that can pass through the screen and are dense enough to be readily removed through rapid settling. The grit is separated from the wastewater and sent to a dumpster for disposal. Step 3. The wastewater flows into four sedimentation basins where chemicals are added to flocculate (an accumulation of particles) the lighter solids (called sludge) and allow them to settle out in the basins. The sludge is then pumped to one of two thickener basins, which allows it to settle further and become thick before being pumped to belt filter presses. Step 4. The belt presses remove much of the water from the sludge by applying mechanical pressure, resulting in a filter cake that is disposed of. Step 5. The wastewater then leaves the sedimentation basins and flows to the intermediate wet well where it is pumped up to the 28 carbon beds. Step 6. The activated carbon removes the contaminants from the wastewater as it passes through the beds. Step 7. 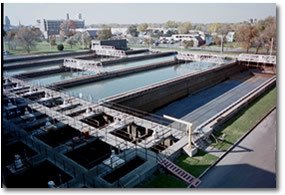 The purified wastewater then leaves the beds and goes through treatment with hydrogen peroxide and sodium hypochlorite for odor control and disinfection prior to leaving the plant through the outfall, which enters the Niagara River. The objective of the wastewater Laboratory is to produce accurate, precise and technically defensible analytical data that describes the status of the Facility’s treatment process as required by our State Pollutant Discharge Elimination System (SPDES) Permit. The Wastewater Laboratory is certified and adheres to the Standards of the National Environmental Laboratory Accreditation Program (NELAP) as regulated by the New York State Department of Health (NYSDOH). The Laboratory is able to perform in-house most analyses required of the Plant by regulatory agencies. The wastewater Laboratory analyzes Niagara Falls wastewater Treatment Plant samples, as well as samples from industries and hauled wastes which discharge to the plant.